Jake is a 5-year old Golden adopted by Paula Kinney, her dog Sayer and cat Tigger in March of 1999. Although Jake had been kept outside most of his early years, he now has no problem finding a couch or a chaise to sack out on. 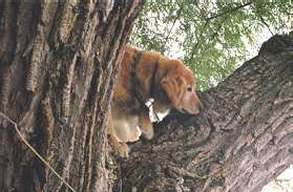 This picture was taken when he was put out for his morning constitutional and climber 15 feet up a tree. Jake’s only real problem is the four-letter word “down”, which takes on a whole new meaning in light of his tree climbing escapade!